Centrum Wiskunde & Informatica: Extracting new knowledge from web tables: Novelty or confidence? Extracting new knowledge from web tables: Novelty or confidence? To extend the coverage of Knowledge Bases (KBs), it is useful to integrate factual information from public tabular data. Ideally, the extracted information should not only be correct, but also novel. So far, the evaluation of state-of-the-art techniques for this task has focused primarily on the correctness of the extractions, but the novelty is less well analysed. To fill this gap, we replicated the evaluation of two state-of-the-art techniques and analyse the amount of novel extractions using two new metrics. 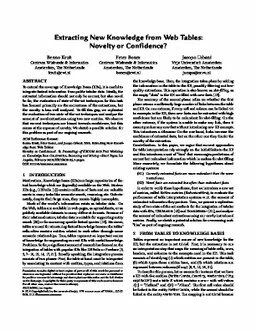 We observe that current techniques are biased towards confidence, but this comes at the expense of novelty. We sketch a possible solution for this problem as part of our ongoing research. Kruit, B, Boncz, P.A, & Urbani, J. (2018). Extracting new knowledge from web tables: Novelty or confidence?. In Proceedings of KBCOM 2018.